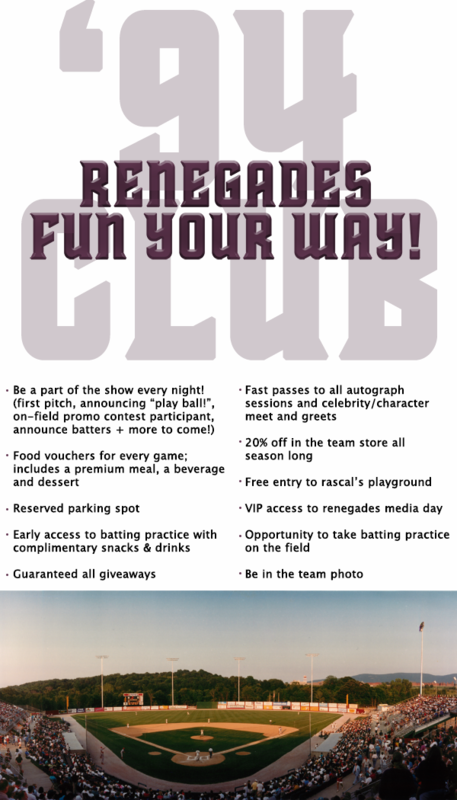 In honor of the Renegades 25th season, the '94 Club VIP Pass allows fans to experience more of what they love and have fun their way. Don't miss out on all of the throwback action this season as the Renegades travel through time during every game. Be a part of all the fan-voted favorites, reminisce on memories and look forward to making new ones with everything this exclusive membership has to offer. Call the Emery & Webb Dutchess Stadium Box Office at 845.838.0094 to reserve yours today or email tickets@hvrenegades.com for more information.